The Center for Science in the Public Interest is escalating its longstanding campaign to reduce the consumption of soda and other sugary drinks today with the release of “The Real Bears”, an animated short film exposing the drinks’ unhappy health consequences. 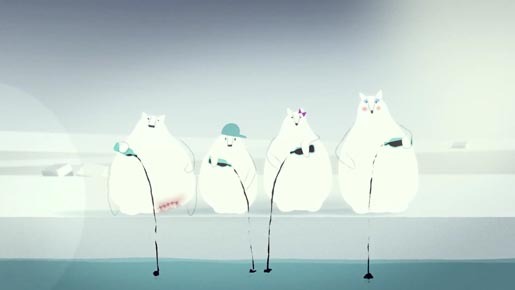 The Real Bears, online at TheRealBears.org, tells the story of a family of polar bears who, even in their distant Arctic environment, are not immune from sunny marketing messages from Big Soda. The whole family is consuming too much soda… and is experiencing everything from weight gain to tooth decay to problems in the bedroom. Only after recuperating from a terrifying visit to Doc Fox’s chilly surgical suite does Pop Bear come to realize that soda has brought nothing but sadness to his family. In the film’s stirring dénouement, he leads his family to reclaim their health and their happiness. “I like the taste of soda and I’ve had my share and I don’t imagine a world without soda. But the reality is that over the years sugary drinks have gone from an occasional treat to an everyday, every-occasion beverage. This project attempts to contrast the marketing hype around soda with the stark reality and it is my hope that it makes some small contribution to a critical cultural awakening. We need to begin to connect the dots between what we are sold, what we eat, and how sick we have become”. The Real Bears campaign was developed at Common, Boulder, and The Butler Bros, Austin, by executive creative director Alex Bogusky, executive producers Marty and Adam Butler, copywriters Ronny Northrop and Ryan Kutscher, art director Stefanie Hermsdorf, account director Mark Ekhardt, producer Amanda Fox. Animation was produced by director/designer/animator Lucas Zanotto, with editor/mixer Travis Wurges, sound designer Nikolai von Sallwitz. The film features an original song, Sugar, by singer-songwriter Jason Mraz, performed with San Diego-based rapper MC Flow. Guitar and mix was by Bill Bell. Horn parts were by Grooveline Horns. Web design was by Cyrus Clemensen.